Herewith are a few photos of the completed cradle. I did use some 18mm beading in its construction to which I screwed the relative parts. I feel confident that the cradle will take some rough treatment with these additions. As for the bottom, I screwed it on at both ends and used Liquid Nails along the sides which I hope will hold and take some of the expected rough treatment. As for the positioning the actual "box" to the end pieces, all I did there was find the centre of the rockers - from the drawings you provided - and measured the same distance up at both ends. Then it was somewhat guesswork getting it straight and parallel. The sloping edges of the back pieces helped in this exercise. Finally, the painting. Expecting some rough treatment and the need to sponge it over - what with perhaps dirty small hands - I went with water based enamel with a satin finish. The result was not as one would obtain with an off-the-shelf item but is acceptable. Kay, my wife, did the excellent job of prettying it up. Overall, Kay and I are quite pleased with the result. 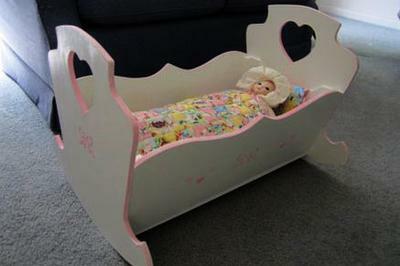 We are sure our granddaughter will love it! Thanks once again for your assistance in this project.